(Wash. DC) The full exoneration of a clear traitor to the Democratic Party predicts how Congress will treat the dire challenges facing the country. There will be little is no opposition to the arranged marriage between corporate and government interests. There will be no remedies for the problems that were created as a result of this arrangement. There will be no accountability for the crimes committed over the past eight years. The looting of the United States Treasury will continue. And the projection of power in behalf of corporate interests will continue when needed, unopposed, without regard to the well being of the nation as a whole or the interests of citizens. The Senate cave-in is a paradigm for past behavior by corporatist Democrats in both houses of Congress. Lieberman's retention of his committee chairmanship and caucus membership is all the proof we need that a majority of the Senate Democratic Caucus finds nothing objectionable to a member actively campaigning for the Republican nominee for president, live and in person. 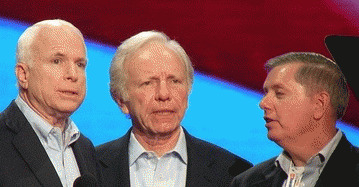 It doesn't matter that Lieberman dismissed the Democratic nominee's qualifications to be president. Could they be any more obvious? "But when they (citizens) look to Washington, all too often they don't see their leaders coming together to tackle these problems. Instead, they see Democrats and Republicans fighting each other, rather than fighting for the American people."